Engineered Viruses Studied to Improve Plant Traits. 28 July 2017. A research study funded by the U.S. Department of Defense is investigating genetic alterations of plant viruses for delivery of genes to quickly protect corn crops against threats like pests and drought. The four-year project brings in researchers from four institutions, funded by a $10.3 million award from Defense Advanced Research Projects Agency, or Darpa. The study, known as Viruses and Insects as Plant Enhancement Resources, or Viper, is looking for ways to improve the traits of maize, commonly called corn, in real time from natural threats such as harmful viruses and pests, and man-made threats such as herbicide, drought from climate change, and pollution. The research is part of Darpa’s insect allies program seeking to bolster food production that contributes to economic vitality, but also defense preparedness. Traditional agricultural techniques offer some protection against threats, but in this case Darpa is looking for techniques, such as gene transfers, to better protect mature plants. The insect allies program, as the name suggests, aims to harness insects as allies for gene transfers, with the Viper project focusing on maize. The project is studying several insect species, such as aphids and leafhoppers, as well as maize viruses, as gene delivery mechanisms. The Viper project is led by plant biologist Georg Jander at the Boyce Thompson Institute in Ithaca, New York, an independent plant biology research center affiliated with Cornell University. Jander is joined by a team from University of California in Davis, Iowa State University, and University of Minnesota. The researchers bring together expertise from the fields of plant genome engineering, plant-insect interactions, and plant viruses. Boyce Thompson Institute cites data showing about 30 percent of maize production worldwide is lost to pests and pathogens, while drought — an increasing threat from climate change — can result in complete crop failure. To meet these threats, the Viper team is conducting research on genetically altering natural plant viruses to carry genes that activate desirable traits in mature maize. The project is also studying the harnessing of insects to quickly deliver gene-carrying viruses. 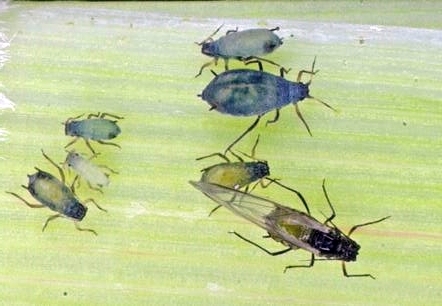 The research is expected to focus mainly on the basic science to assess the feasibility of genetically engineered viruses carried by insects to deliver genes to improve traits in mature corn. Project participants stress the study will be conducted in greenhouses and growth chambers, with no genetically engineered viruses, insects, or plants released into the environment. “The biggest impact of the Viper project,” says Jander in a Boyce Thompson statement, “will be the development of a toolkit to rapidly counter sporadic and emerging threats to this valuable crop.” The methods developed in the project are expected to be adapted in further basic and applied research on maize, as well as other crops. 1 comment to Engineered Viruses Studied to Improve Plant Traits.